Almost from the start, the Sinclair computers were supported by numerous third-party peripherals manufacturers, offering everything from memory expansions to printers to mass storage devices. 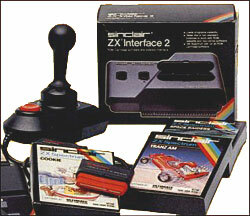 Sinclair Research and (later) Amstrad were not slow to offer their own peripherals, most of which sold extremely well. However, Sinclair was strangely uninterested in supplying badged products, such as an official Sinclair cassette recorder, which would have sold like hot cakes. Third-party manufacturers filled the gap by repackaging cheap Far Eastern tape recorders as "datacorders" and made substantial amounts of money in doing so. Sinclair's American partner Timex did not make the same mistake, with third-party tape recorders, modems and printers appearing under the Timex name (see Timex Peripherals). SJS2 joystick - Amstrad, 1987? SP200 printer - Amstrad, 1988? A number of upgrades were also available to improve the capabilities of the ZX80 and ZX Spectrum.